The BUILD Act is a bold solution that establishes an American Infrastructure Financing Authority (AIFA) – a type of infrastructure bank – to complement our existing infrastructure funding. This institution, which would provide loans and loan guarantees, would be both fiscally responsible and robust enough to address America’s needs. AIFA is independent of the political process. It would fund the most important and most economically viable projects across the country, our states, and our communities. AIFA is also fiscally responsible. While AIFA will receive initial funding from the government, after that it must become self-sustaining. AIFA closely follows the Export-Import Bank model, which has helped to boost American exports and has been profitable overall to the government since 1991. Finally, AIFA relies on the private sector. It can never provide more than 50 percent of a project’s costs, and in many cases would provide much less, just enough to bring in private investment. This sounds good, much better than other infrastructure banks, sort of like the one we proposed. The key bit is that the bank is self-sustaining and profitable. There are details that one could quibble with, little things like scope and where the money comes from, as well as the rural subsidy, but those are less important than then main point, the loans have to be repaid rather than are simply grants. 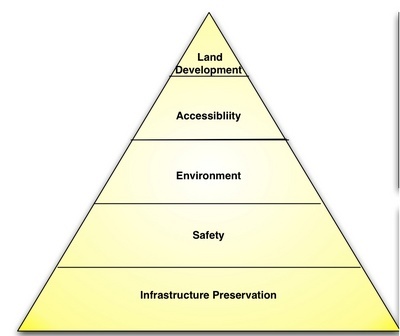 The figure shows the “Hierarchy of Infrastructure Needs”. It offers a useful organizational tool for considering the priorities of transport investment. Borrowing from Abraham Maslow, it suggests that the first priority, at the base of the hierarchy, is Infrastructure Preservation. Without existing infrastructure being maintained, everything else falls apart. Given current financing challenges, existing infrastructure is deteriorating. Fortunately, through investment this problem can be reversed. The first part of the proposal Fix it First, Expand It Second, Reward It Third: A New Strategy for America’s Highways by Matt Kahn and myself seeks to rectify this problem. At the second level of the hierarchy is Safety. If people do not feel safe, they will not travel by that mode. We see this in urban transit, aviation, and in adverse weather. Over 30,000 Americans die in road crashes annually, a vast improvement over previous years. Still, that is far too many, and one of the highest unaddressed costs of transportation. People overestimate their safety by car (and underestimate it by other modes), perhaps because they feel in control. Most safety progress will occur due to vehicle improvements and changes in driver behavior, (and ideally taking the driver out of the loop) but safety can be enhanced through select infrastructure improvement projects. At the third level of the hierarchy we place Environment. This includes air, water, land, noise, and the challenge of climate change. Environmental costs are externalities, that is, they are not largely borne by those who cause them. Projects that can reduce these social costs will generally be underfunded by the private sector or public agencies without some specific support. This is and subsequent elements are addressed in the later parts of the proposal “Expand it Second, Reward It Third”. Fourth on the hierarchy we locate Accessibility, the ability to reach valued destinations. This is the primary purpose of transportation: why travel but to get somewhere? Accessibility is a product of two complementary forces: land use – where things are located, and mobility – how fast I can move on the network. Transportation projects directly affect mobility, and indirectly affect land use (generally over a longer period of time). Transportation, like many technologies, is subject both to network effects (the more transportation there is, the more places I can reach, the more valuable transportation is, the more transportation is provided), and diminishing returns (once everywhere is connected, new connections are less valuable than old connections). Different modes in different places are in different stages. Enabling current users to go faster (save time), and farther (get better services) in the same time are both valuable contributions of transportation systems. Some projects offer no incremental benefits along these dimensions but offer higher quality in terms of the comfort of travel (think of a crowded subway at rush hour versus being able to find a seat). Finally, new transportation enables Land and Economic Development, building at higher densities, reallocation of activities, and the ability to decentralize. These benefits are the most speculative, as transportation, while necessary, alone is insufficient to induce developers to create places. Promoters often cite economic development as a reason for transportation investment by the public sector. We suggest that if promoters believe in their project, they, not the government, should be liable for the risk that project fails to perform as expected, just as they would reap the benefits if it were successful. These are five dimensions of what to achieve using new transport investment, and the qualitative importance of each. While there are trade-offs, putting each dimension into equivalent monetary terms is difficult and contentious. Therefore, perhaps these goals should be addressed individually. “Fix It First, Expand It Second, Reward It Third” achieves these goals better than the status quo policies.